There are days when I want one of those cute little status bars so I can crow repeatedly about my progress. But, honestly, I never go look at people’s posts on their actual blogs now that I have a decent feed reader, so I doubt anyone but me sees the stuff in the sidebar on mine either. I have finished the major knitting. That is the right front, the right back, the left front, the left back. I have seamed the two lefts and two rights together, so I have only the one center seam left. This was a major accomplishment because I had no idea how to properly seam knitted garment pieces. I watched the Knitting Daily episode on PBS where they had rigid heddle looms and Rick MrDragon (or something like that, he is the must-be-colorblind man who is really famous in the knitting magazine world (colorblind because anyone who sees the world in more than grayscale finds his projects to be eye-bleedingly colorful)) demonstrating proper seams. I learned it from that. 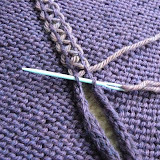 I took tutorial photos of the seaming process (but have not written it). So current status (as of 11am) is I need to do one major seam and do the edging and weave in any loose ends that remain. Without slacking off entirely, I might finish an entire sweater vest in under 3 weeks.